When Rob and I were researching places to go for our honeymoon Montreal was his only choice. Being semi-fluent in French and having an affinity for arts and culture, Montreal was an obvious hit. I had my eye on the Pacific North West, wanting nothing but mountains and seas and dreamy moss covered forests. After looking around the web at different images and descriptions of Montreal/QC, I changed my mind and we booked our tickets right away! The upper-right corner of Canada might as well be the Paris of America. They’re stubbornly French, steeped in an appreciation for history and the arts, and they have a deep appreciation for intricate architecture. Our first stop was a couple of days in Montreal, in the Little Italy neighborhood a couple of blocks away from the Jean Talon Farmers Market. When I booked our Air BNB I tried to settle into a spot that had plenty of charm and local character, since we’d be on foot for the week. Every day we’d walk to a little coffee shop called Laure et Fils, I’d grab an Earl Grey and we’d sit beneath the gothic style catholic church and watch the children stream out in a row on their way to and from summer camp. After our hearts were full of the sips and sounds we’d head over to the glorious Jean Talon market, supposedly the largest outdoor farmers market in North America! We’d grab a loaf of bread, some beautifully colored fresh tomatoes and basil, and a handful of other ingredients to make a yummy afternoon tartine. The market shaped our stay in Montreal, giving us a glimpse into the local ethos and culture, and continues to give me an itch to just hop on over and move in. Prior to our trip we didn’t do a lot of research into must-see places because we hoped our Air BNB would be close to some cool neighborhoods that would provide all our exploring needs, and boy were we right! Down the spiral staircase below our apartment (something most city apartments have in Montreal! ), a tiny restaurant called Huis Clos ended up being our absolute favorite meal of the whole trip! I don’t even really remember what we ate, I just remember we kept looking at each other in amazement at how delicious everything was. Botanical Gardens - We spent a whole afternoon wandering around these luscious gardens and it was hardly enough. The evergreen forest stole my heart. An absolute treasure for plant and art lovers. Mamie Clafoutis - We got a couple of delicious loaves of bread from here while we were strolling around! They have several locations around town. Engaufrez-vous - After walking what felt like 2,000 miles I was beyond the hungry point of no return and we rounded a corner to see a hilarious waffle sign sticking out of the wall. We walked into the tiny cafe and looked at a menu. Rob translated enough for me to know that the nutella stuffed waffle with a side eggs and fresh fruit was exactly what we needed. The cafe was so cute, and we got an incredible amount of food for a great price! Highly recommend. 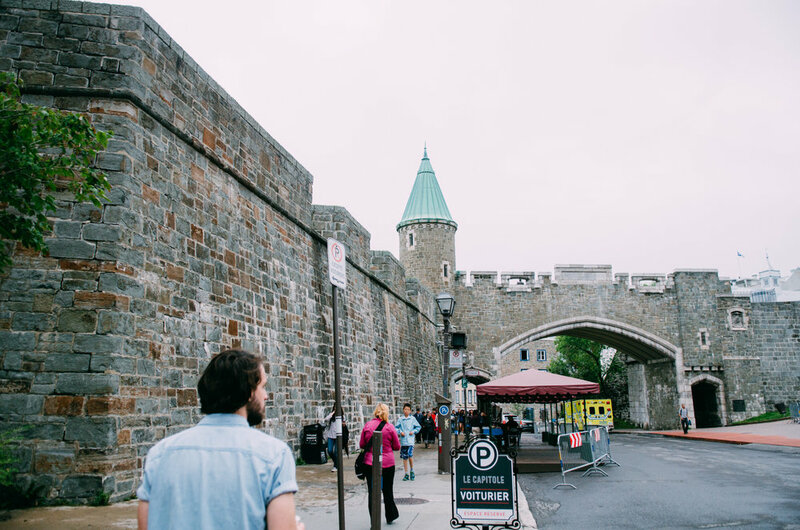 After our stay in Montreal, we rented a car and drove 2.5 hours north to Quebec City. You can easily take the train, but we love long car rides and wanted the option to stop and explore if we saw something cool. About halfway there we passed a sign that said “Windmills, this exit” so of course we had to stop. We wandered off the road following the windmill signs until we found a teeny tiny town with a rich history built on wind power. We met a warm and cheerful museum guide who was beyond excited to visit with us and practice her english. She grew up in the neighborhood and returns during the summers to work in the museum. We walked around by the water and climbed to the top of the windmill to learn about how that one structure used to power an entire town! A worthy stop on our way to Quebec City. We chose to stay in the Haute-Ville area of QC, near all the restaurants and shops and a little ways outside of the Old City. We were delightfully close to Chocolats Favoris, an ice-cream shop that feels like the heart of Willy Wonka’s chocolate factory. After a week of non-stop walking, sometimes all you need is a huge burger and a basket of fries, and Chez Victor hit the spot. Tucked away in a little nook of a building, it was a sweet spot to rest for a bit, and we made friends with the couple siting next to us! 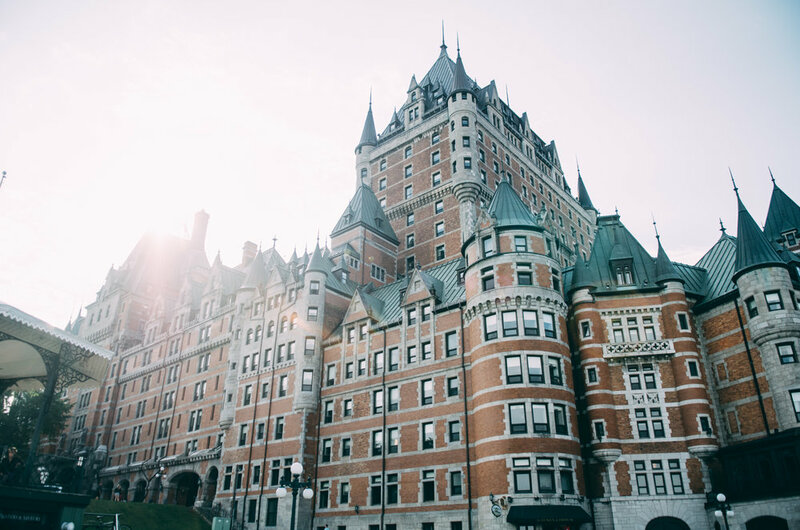 We explored the old city every day, and walked around the towering Hogwarts-esque Chateau de Frontenac. If you have the room in your budget, I’d imagine staying there would be a total dream! Montmorency Falls - Take a bus (but make sure it’s going the right direction first…) to the breath taking waterfalls. Incredibly beautiful hike, stunning views and other-worldly terrain on the descent down the side of the cliff. Plan an afternoon for the whole hike, and bring a snack! One of my favorite days of the whole trip! The Citadel - Walk up to the top of the hill and sit for a spell to get a gorgeous view of Chateau de Frontenac and the old city. We didn’t tour the fort, but we walked around a bit. Simons - Similar to Uniqlo or Zara, if you need an outfit change, or you didn’t bring a sweater with you, a quick pop into Simons might do the trick! Stroll the old city - Some aspects of the old city can seem a little too touristy, but little pockets of history and culture are scattered throughout the old cobblestone streets. Well worth searching for. We fell in love with the region and hope to spend at least a couple years of our lives there in the future. I’m happy to answer any questions about Montreal/QC! Send them away!